More details have come out through Lethbridge newspapers/radio that Bellerive and the 2 others were injured in a fire at a bachelor party. One of the 3 players is said to be in critical condition. Yohe spoke to GMJR this morning. No new info on Bellerive (or the other 2) as of this morning. Jason Mackey reports he is being told Bellerive IS NOT the person listed in critical condition. Penguins also released a brief statement, just stating they have been in contact with Jordy. Word is someone, not the injured parties, threw a substance into a fire pit at the bachelor party. Rumors are circulating on social media that the substance was gasoline. Rumors also circulating on social media that Jordy's hand is severely burned. I haven't seen anything about Jordys hand. I did read that the player in critical condition has been placed in a medical induced coma. Still no word as to whether it is Alfaro or Vandervlis, however, there are a few reports that the critical injured person is Vandervlis. According to Calgary EMS, the incident happened shortly before midnight on Friday. Emergency crews received reports of multiple patients being injured and intercepted a private vehicle carrying three adult men on the outskirts of Calgary. EMS said the patients — one in serious condition, one in serious, potentially life-threatening condition, and one in critical life-threatening condition — where rushed to Foothills hospital by ambulance. Early Sunday afternoon, Cochrane RCMP said in a media release three people were injured Friday night when a "substance was placed in a fire pit that caused an explosion" in the Bearspaw area west of Calgary. Thoughts and prayers to all involved. ville5 wrote: Thoughts and prayers to all involved. My next question will be, is he going to be able to participate in development camp after the draft, and/or prospects tournament and/or training camp. We've been told he will make a full recovery, but no details have been released on his injury or recovery time. All that is back burner stuff right now with someone still in critical condition, but those are some team related issues. If one of Brassard or Sheahan were not on the roster, I would think Bellerive would be in the conversation to make this team if he has another training camp like he did last year. Unfortunately, he doesn't turn 20 until May, so, as the team currently stands, he is likely to head back to Lethbridge this season. FLPensFan wrote: My next question will be, is he going to be able to participate in development camp after the draft, and/or prospects tournament and/or training camp. We've been told he will make a full recovery, but no details have been released on his injury or recovery time. All that is back burner stuff right now with someone still in critical condition, but those are some team related issues. In all fairness, if ville5 is correct and the least injured is in "serious condition" and the injury is a burn, I'd be hard pressed to see him in action anytime soon. Does the organization view Bellerive as a Center or as someone who is better suited to play wing at the NHL level? He's marginally taller and a little heavier than Guentzel, and we all know Sullivan's stance on playing Jake at Center. I have not heard anything about his playing position. I assume center, since that is his natural position and we haven't heard anything from the team about where they expect him to play. That is likely because he isn't yet under team control (still playing at Lethbridge vs AHL). Guentzel was a center in college at Nebraska-Omaha and Sullivan didn't want any part of him playing that position in the NHL. We will have to see with Bellerive when he gets to the AHL or NHL level but I wouldn't be shocked if he isn't moved to wing. Of course a lot of things could happen to change that situation. According to a new statement by the team, in conjunction with several others, the 3 players were not at a bachelor party. They were at a get together hosted by former teammate Tyler Wong. There was Tyler and 9 other former teammates (or current Lethbridge players) at the gathering. The intention was for the players to stay at the residence Friday night, and then attend a golfing and camping outing the next day. In the statement released by the Wong family, it appears the players were igniting a bonfire when the fire/explosion occurred. They don't say this, but I'm guessing either a fire starting type device (duraflame log, something similar) or gasoline was used to help ignite the fire, and that is what caused the issue. 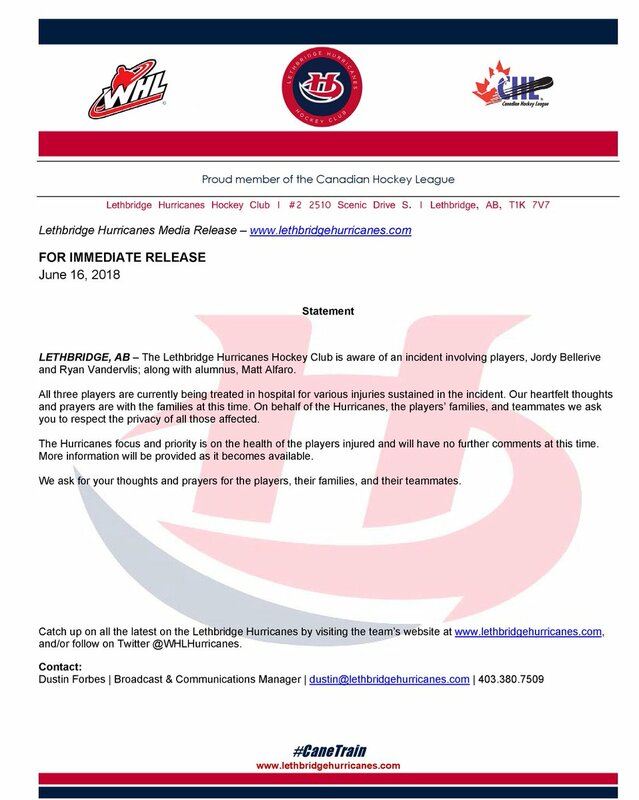 According to the team, Bellerive and Alfaro are still in the hospital in stable condition. No word on their specific injuries, severity/location of burns, etc. Vandervlis is in a medically induced coma with severe burns to his body, and is still in critical condition. If you saw the RCMP report of how they "intercepted a private vehicle," Wong's family reacted quickly to the situation and immediately got all 3 injured players into a car and headed straight for the hospital, and EMT/ambulance met/caught up to them along the way. If one builds a bonfire with gasoline they're setting themselves up for a disaster. The air itself (especially pockets of it trapped under the wood to be burned) can be set on fire. For anyone who doesn't know this, please keep that in mind when building your own bonfires. Gasoline isn't flammable, it's explosive. Kerosene is flammable. interstorm wrote: If one builds a bonfire with gasoline they're setting themselves up for a disaster. The air itself (especially pockets of it trapped under the wood to be burned) can be set on fire. For anyone who doesn't know this, please keep that in mind when building your own bonfires. Yep...this is a very stupid act, but one that a lot of younger "kids" make! Hopefully everyone makes a full recovery! Just for clarification, there have been rumors that gasoline was used. That has not been confirmed. Bellevire suffered very severe burns. Jim wrote: Gasoline isn't flammable, it's explosive. Kerosene is flammable. Gasoline is flammable. In its liquid state it will not burn and will only ignite when it vapourizes into a gaseous state. All flammable liquids give off vapours, it’s just a matter of being between the LEL and the UEL. Ryan Vandervlis out of coma. Fundraising has begun. All the best in your continued battle. Bellerive has been released from the hospital today.